1. Who needs to File Form 2290 Online and pay Heavy Vehicle Use Tax? A trucker who has a heavy motor vehicle with a gross weight of 55,000 pounds or more must File IRS Form 2290 Online. Generally, the owners of vans, panel trucks, pickup trucks, etc., are not necessary to pay or file Form 2290 Online for their small trucks. Also, trucks which use the 5,000 mileage limit or less (7,500 for farm trucks) are must file 2290 Online but no need to pay Heavy Use Tax. 2. 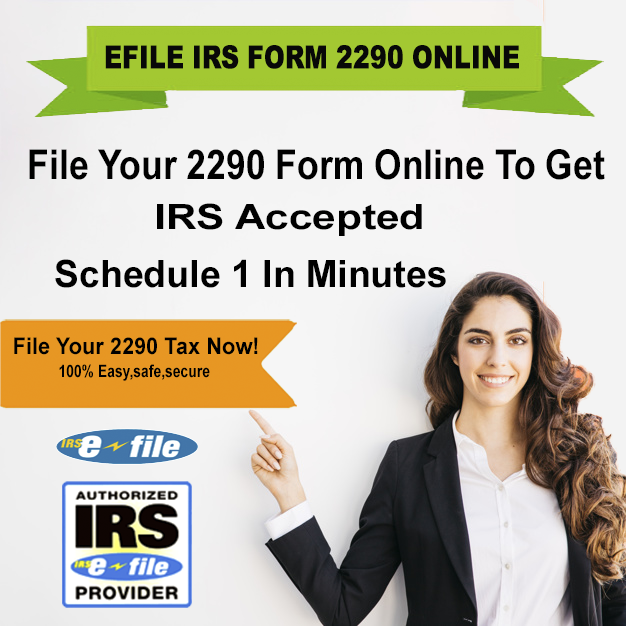 What is E-file Form 2290? 3. Why Employer Identification Number (EIN) is necessary for to e-file Form 2290? An EIN number is a unique identifier that is used to recognize the taxpayer’s records. If EIN is not matched with the IRS records then your 2290 Filing may be rejected. 4. With the just received EIN, can I file my return electronically ? After two weeks i.e, from the date your name control is assigned with an EIN, you can Pay HVUT 2290 Online. If you file before the two weeks of 2290 Deadline, then your E File Form 2290 may be rejected. 5. Who are an IRS approved e-file provider? 6. How one can know that the IRS has received their return? Filers can get a quick email notification once an IRS accepted their Form 2290 Online. Also, IRS Authorized Schedule 1 also sent through email which is watermarked & consist Efile Logo in the background of it. 7. Is it possible to make corrections to my e-filed return? The changing of Gross Weight, Mileage Limit, and VIN are possible with the Form 2290 Filing. If you want to make any change, you can do it and send them again to an IRS. 8. 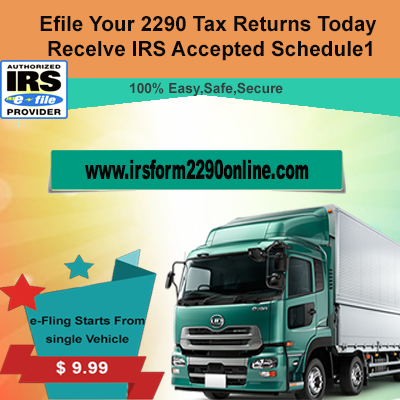 If I buy another truck after I have e filed my 2290 Form for the present tax period, should I file my 2290 again and simply add the new vehicle to the Schedule 1? Once if you finish your Form 2290 Filing, you can change it to add new truck vehicles details. You just need to File another IRS 2290 Form to inform about your new vehicles. Also, remember that you need to file for the new vehicle by the next month end as you started running it in this month. 9. May I file one Form 2290 for two trucks that I start on the road in two different months? No. You need to file two 2290 Forms for two different trucks which are used in two consecutive months. You can get two Schedule 1’s for two different vehicles. In the next year, you can pay Heavy Vehicle Use Tax with only one 2290 Tax Form for the trucks you use them on roads for 12 months of the next tax year. 10. What should I do if my Heavy Vehicle Use Tax Return is rejected by an IRS for duplication? 11. When I submitted my Form 2290 electronically, I received an online duplicate filing error. Why did this happen? If you entered the Same EIN for the same tax period for the same vehicle or the same VIN then you get online duplicate filing error. Therefore, check the exact information recorrect it and Efile Form 2290. 12. Can I claim a refund electronically for a vehicle that was sold, destroyed or stolen during the tax period? Yes. You can claim the credit for the tax paid on your vehicle. But the credit you will get only the amount you paid as a tax. The amount depends on the vehicle was sold, destroyed, or stolen. 13. Can I claim a refund electronically for a vehicle I used less than 5,000 miles during the tax period? 14. What are the steps to file Form 2290? STEP 1: Create Your Account with free registration. STEP 2: Enter Business & Truck Info. STEP 4: Receive IRS Stamped Schedule 1. 15. Can I file for multiple companies with Single account? Yes. You can file for multiple companies from a single registration account from www.irsform2290online.com. The companies which consist of multiple EIN’s to file can use a single account to finish their IRS Electronic Filing. 16. I already signed up. How do I access my account? You can get a User Name which is your email address. The Password is mailed to your registered email at the time of sign up. 17. I can’t log in. What should I do? You can reset your password and can create a new password. 19. How do I get my Schedule 1? After you electronically file Form 2290, you can get an email which consists IRS Stamped Schedule 1. 20. When do I file my 2290 for the tax period of July 1, 2018 – June 30, 2019? The deadline for 2290 E Tax Filing Form is August 31. You can file by the next month end if you start running vehicle in this month. 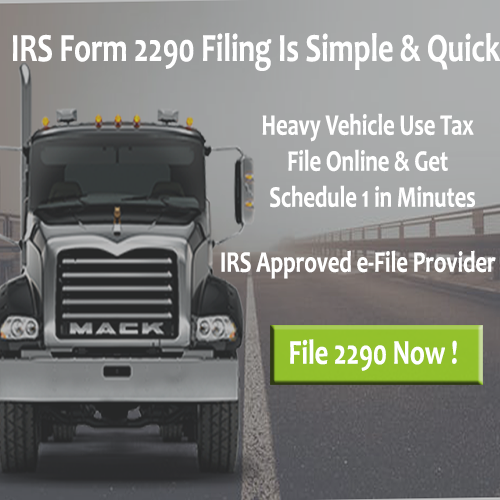 One must File & Pay Heavy Vehicle Use Tax within the Form 2290 Due Date. 21. If I lease or sub-contract, who’s responsible for filing the annual 2290? Unless you are a third party filer, the oner of the vehicle files the Heavy Vehicle Use Tax. 22. Should I keep copies of my 2290 filings? It is better to keep the copies of 2290 filings. They only help you form IRS Audits. 23. What is Taxable gross weight? Taxable gross weight is nothing but the unloaded weight of a truck. The empty weight of the truck is considered a taxable gross weight of the vehicle. 24. What will happen if I forgot to file Form 2290 or did late filing? 25. Can I use my Social Security Number as an EIN? No. You cannot use your Social Security Number as EIN Number. IRS Doesn’t support an SSN as an EIN. 26. What are the IRS Form 2290 Requirements?